In the modern world, our daily activities follow and leave a rich trail of electronic data from e-mail and text messages to credit card transactions and medical records. At its simplest, the data could be an address book or contact list stored in a text file while more complex information such as a store’s inventory and customer information might take up terabytes of space on network servers and require full-time administrators to maintain it. Most of this data is stored in electronic databases of one kind or another where it can be searched, sorted and easily retrieved as needed. After a basic understanding of how to work with computers, knowing the basics of how data is stored and manipulated is an important part of being technically savvy in today’s world. Whether you work with large amounts of data and need to organize it better or you need to communicate with the people who do, the better you understand the technology, the more effectively you’ll be able to face the daily challenges that come from living in a data-driven world. This entry was posted in Careers, Database Design, Microsoft Access on January 29, 2014 by Andrew Comeau. Occasionally, you might have a table in Access that contains duplicate records. Maybe it was imported from one or more sources or perhaps it was not setup with the necessary key to ensure unique records. Whatever the reason, now you want to make sure that the records in the table are unique. Fortunately, Access offers a couple of options that you can use to remove the duplicates from your table quickly and easily. This article will explain two methods for removing duplicate information from tables. Read the full article here on Drewslair.com. This entry was posted in Articles, Database Design, Microsoft Access on May 26, 2013 by Andrew Comeau. One of the strengths of Access is its ability to import and link to data from different sources. Excel does this too but with Access you can go on to query and report on the data in ways that Excel doesn’t readily provide. This can come in handy as part of an application but it’s also useful for quick analysis of new information. It seems there was an issue with the Access 2007 / 2010 version of the program that I believe had to do with differing installations of Access 2007. I’ve corrected the problem and the corrected version is available for download. Whether or not you’ve bought the book, JobSearch 2010 is definitely worth a look. This is a free program designed with Access 2007 that helps to organize your job search by enabling you to store complete information on every job lead in one place, track the progress of individual leads and follow-up on opportunities more effectively. If you don’t have Microsoft Access, there’s a version that includes the Access 2007 run-time, a free version of Microsoft Access that will enable you to run the program and change data while preventing any design changes to the program. For more information, check out the download page where you’ll find links to all the versions available and a program manual to help you get started. This entry was posted in Microsoft Access, Resources, Software on April 15, 2012 by Andrew Comeau. Every so often, I remember that I have a blog attached to the site and I make new promises to myself to keep it up to date but it doesn’t seem to happen that often. 2011 was a busy year for me which was one reason I didn’t update the blog much. It’s easier to post quick thoughts to Facebook than deal with the expectations of a blog entry. Those updates tend to get lost in the ether, though, and if I’m going to spend time and effort writing interesting things, I’d rather use them for my own promotion than Facebook’s. After working independently for an extended period, last year started with a new full-time job that looked like an interesting opportunity. I did manage to gain some extra experience with ASP.NET while acting as the sole developer on an online solution for the company and consulting on other applications. The position was not without its drawbacks, however, and at the end of September I had my first experience of anticipating exactly when the axe was going to fall. When I left for the day one Thursday, I made sure to clean out my desk and sure enough, the layoff came early the next day. I hit the ground running, though. 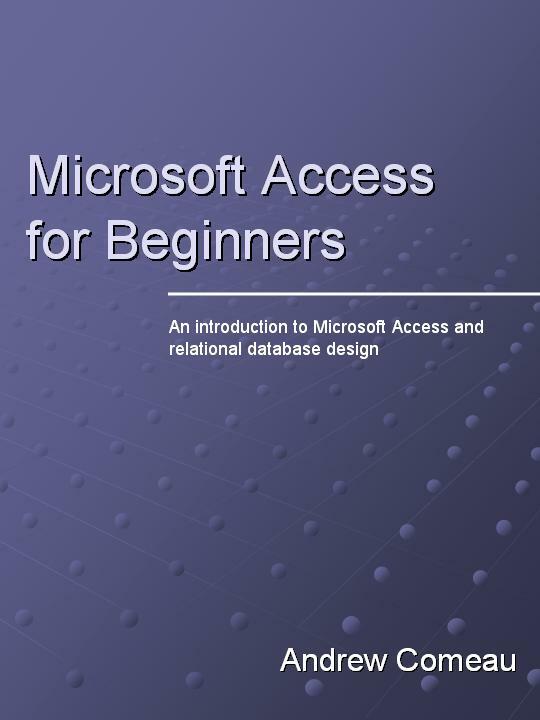 By the end of October, in addition to updating my resume and other job search fun, I’d completed the project to turn the Microsoft Access for Beginners series into an eBook. On October 31, it went live on Amazon.com as my first Kindle offering and I’ve started to see some sales. I probably should have added a dedication to Starbucks where I spent so many hours staying caffeinated while editing material and figuring out how to get around formatting issues. I decided to see how the book plays on Amazon.com before reformatting for other outlets and I was a little sick of looking at the project so I moved on to other things including setting up a Facebook page for Drewslair.com. After sending out some more resumes, my phone started ringing off the hook and by the beginning of December, I’d landed a new contract as a programmer at a local company. I actually managed to get two job offers within 24 hours which was a new experience for me. The other one would have meant moving to Jacksonville and I decided to stay local. So, since December, I’ve been gaining a lot more experience developing ASP.NET web applications with Visual Studio 2010 and SQL Server 2008. Having a regular work schedule again where I could leave the job behind at the end of the day was nice for awhile but I’ve also found it’s inherently limiting. I need to start accomplishing things on my own again so I’m looking at dusting off some of those projects that I put on hold to accommodate the day job and seeing what I can do with them. This entry was posted in Careers, Microsoft Access, Programming on April 6, 2012 by Andrew Comeau. A visitor to the site asked about using ALT-TAB to switch between open Access windows. This refers to the “Windows in Taskbar” feature which was available in Access prior to Access 2007. You could set Access to display a button for every open Access window on the Windows Task Bar and use the standard ALT-TAB to switch between them. I usually disabled it because I didn’t like all of those taskbar buttons for the same program. This feature is no longer present in Access 2007 / 2010, although it’s still available for Word and Excel. One option that is still available is the Ctrl-F6 key combination. Using Ctrl-F6 or Shift-Ctrl-F6 (for reverse order) you can switch between all open windows in your Access program, including forms, open tables and the database widow. Of course, I usually design Access applications to keep only a couple windows open at a time and my forms have links or buttons that take the user back to the appropriate menu or screen. During design time, though, or when you’re creating a quick and dirty app for analysis, this can come in handy. This entry was posted in Microsoft Access on November 17, 2010 by Andrew Comeau. 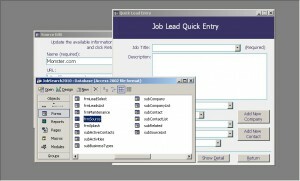 JobSeach 2010 is now out of beta testing and version 1.01 is available for download. If you’re looking for a job or know someone who is, this is a great tool that can help you maximize your search. 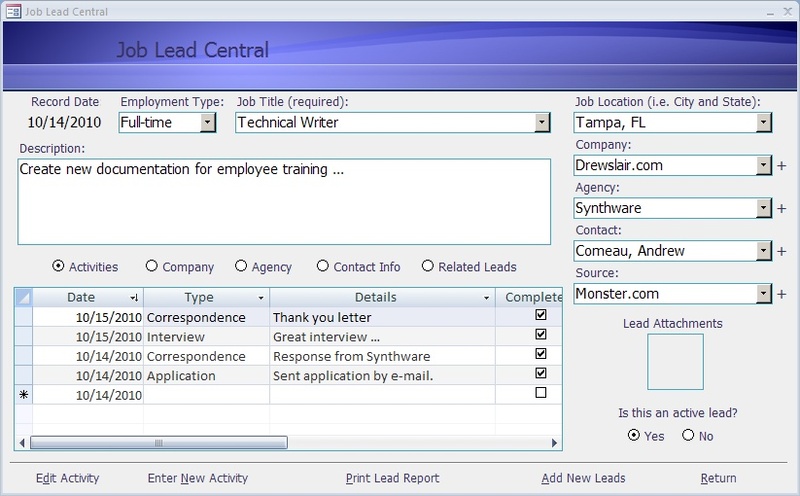 JobSearch 2010 includes contact management, lead tracking and flexible reporting all in one program … and it’s FREE! No obligation, no registration, no charge! This entry was posted in Microsoft Access, Software on November 3, 2010 by Andrew Comeau. This entry was posted in Microsoft Access, Programming, Uncategorized on September 2, 2010 by Andrew Comeau. 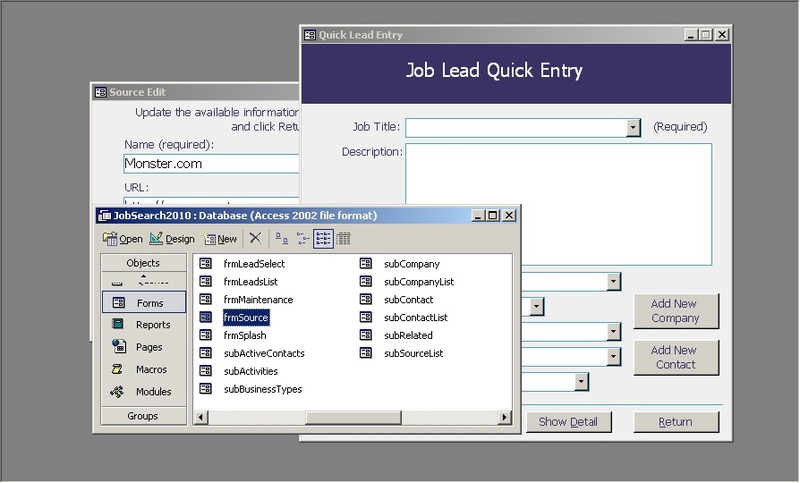 JobSearch 2010 is a personal job search organizer that enables you to manage all of your information in one easy to use program. With this tool, you can maintain complete detail on each lead and have it all instantly available at the click of a mouse or offline through one of the available reports. Never lose track of an opportunity again or be at a loss for the information you need on an interview with this free software from Drewslair.com. 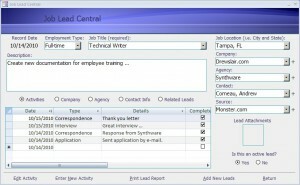 The beta version of JobSearch 2010 is now available for download and testing. If you’d like to try it out and give your input on how it works for you, you can see the full details with screenshots at on ComeauSoftware.com. In addition to the free download, I will be starting a series of articles detailing the development process for JobSearch 2010 for those interested in learning more about programming and software development. So keep checking back because there will be more to come soon! This entry was posted in Microsoft Access, Software on August 28, 2010 by Andrew Comeau. Getting in Sync – Using recursion to compare directories in VB.NET. It was an interesting project for the week; not only in writing the program but deciding how to present the information and files on the site. I’ve been wanting to add some more advanced content for awhile and I think this article came out pretty well. My project for this weekend is reviewing the Programming Microsoft Access series that I posted a couple months ago. Last night, I happened to think about them and started wondering if the articles were enough. So far, the review’s going well. As always, I welcome your input! This entry was posted in Microsoft Access, Programming on May 7, 2010 by Andrew Comeau.